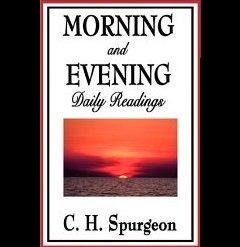 MANY of Spurgeon’s writings are 99¢ right now; others are free! Spurgeon was called the Prince of Preachers for good reason - and this book is filled with bite-sized Spurgeon devotionals. He has so much godly wisdom, such a love of Christ and such a mastery of language, all packed into a powerful presentation! I can't help reading ahead on occasion, I truly LOVE this devotional. I often use the scripture he references for further study and am always blessed by it. I have the Morning and Evening app on my phone, but having this in book form, to make notes, highlight, etc. is worth every penny!